Denny's Deal! If you are one of the first 500,000 to register, you will receive your voucher for the FREE burger & fries via email on February 28th to use that week. From 2/1/10 through 14th, the first 500,000 people who sign up for the new Denny’s Rewards program online will receive a FREE burger and fries available 3/1 through 3/7/2010. 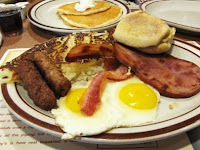 OnFeb 9 Denny's is offering a Free Original Grand Slam® from 6 a.m. through 2 p.m. at participating restaurants.